What Is The Best Floor Tile For Your Kitchen? Tile flooring is a natural choice for kitchens. Tile is hard, durable, and water-resistant and shrugs off stains. Plus, it’s beautiful—your kitchen flooring ideas will blossom when you look through the huge array of styles, shapes and colors available. Kitchen floor tile comes in three primary types: porcelain, ceramic and stone. Prices of each type run the gamut, from $2 to $100 per square foot, based on a report from the DIY Network. Ceramic and porcelain tile are both made from clay mixtures fired at high temperatures to produce a hard, durable tile. Both come either glazed or unglazed. However, there are important differences. Porcelain floor tile has sand added to the clay mixture and is made with heat and pressure to produce a tile that’s harder, denser and less porous than regular ceramic tile. It’s a good choice for high-traffic areas, kitchens and bathrooms. It’s tough enough to be used outdoors in any climate. Glazed porcelain tile has a glass-like coating applied during firing that produces a colored surface. Unglazed porcelain has color added to the clay mixture so the color and pattern is carried all the way through the tile. Any wear or scratches won’t show on unglazed porcelain. Porcelain tile can be difficult to install and requires special tools and should be installed by a professional installer. Regular ceramic floor tile is sometimes called “non-porcelain” to clearly differentiate it from porcelain. It’s softer than its porcelain cousin and glazed to create a hard wear surface in virtually any color. Because it’s softer, it’s easier to cut and install, but it is recommended to use a professional installer. Although it’s more porous than porcelain, the glazing creates a surface that’s impervious to kitchen spills and splashes. Stone floor tiles are made from natural stone including slate, granite, limestone, travertine, and marble. Most stone tiles are porous and need to be resealed with a quality stone sealer every two to three years. Stone can be polished or honed. Polished stone surfaces are slippery when wet, but the polishing lets the full beauty of the stone show through. Honed stone tiles provide more traction but have a less vibrant look. While tile can be a great choice for kitchen floors, the hardness that makes tile so desirable as a kitchen floor surface can sometimes be a drawback. If you are a serious cook be sure to wear comfortable shoes or use a floor mat at the work center, i.e sink, range ,cooking because standing on tile for long periods of time can tire out legs and strain your back. Tile is also cold on bare feet and if you tend to be clumsy in the kitchen, dropped dishes, mugs and glasses will break on impact. With today’s many designs and tile selections to choose from you are sure to find the best option to suit your kitchen. Be sure to stop by our newly expanded Showroom and a take a look at our latest selection of tile for your kitchen project. Is there anything more fun that remodeling your kitchen? 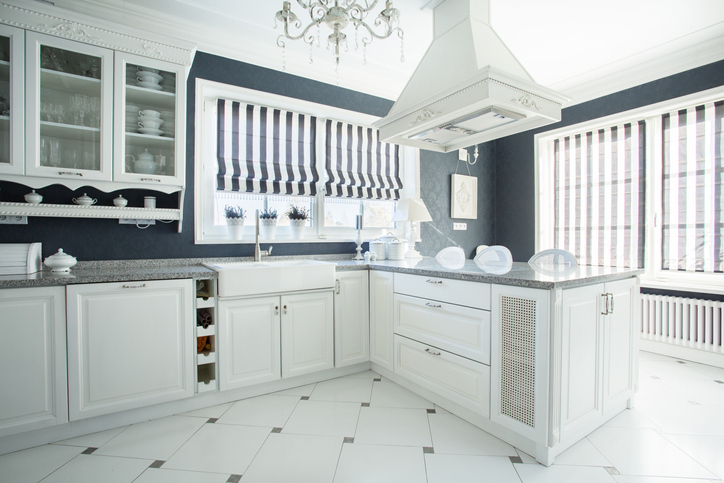 Despite the disruption to daily like, a kitchen re-do can be exiting as you select new appliances, countertops, accent pieces and of course flooring. Plus investing in a kitchen upgrade can impact the bottom line when it comes to resale of your home. With so many options in kitchen flooring you want to be certain you not only select what is trending today, but also styles that have longevity in the marketplace. For starters, wood is in! Or at least floors that look like wood. 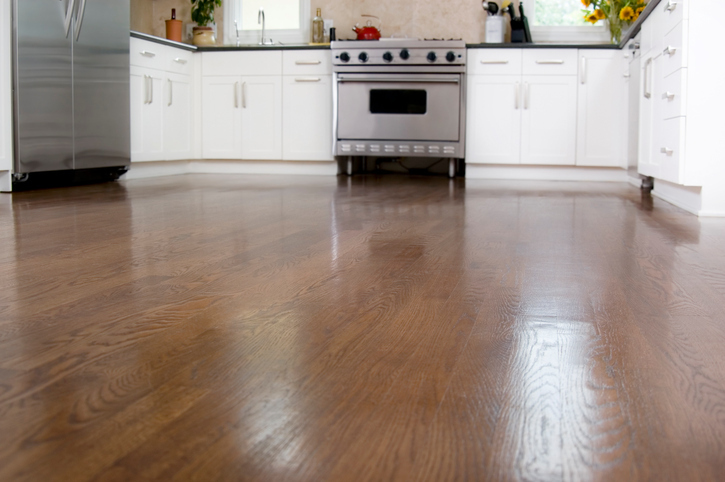 With modern technology, just about any floor can mimic the look of real wood, without the maintenance issues. Based on FooringInc.com, these are a few trends to look for. Tile is durable and easy to clean and has been a flooring staple for year. The wood-look tile kitchen flooring trend is very popular right now.Tile manufacturers are keeping up with the times and following the trends of contemporary wood and stone. As technology improves, so does laminate flooring. You will see even more convincing wood looks and all of the current wood trends including hand scraped wood looks, distressed wood looks and even high color variation. Engineered wood is a relatively new kid on the block. A step up in durability and perception from laminate, engineered wood is the only option (aside from solid hardwood, obviously) that is made from real wood. As more homeowners embrace the light, airy feel in their home, you will see a huge resurgence in blonde wood (and wood-look) floors. Blonde floors, in particular, can give you that light and airy timeless feel. Dark floors are still very popular. In the kitchen, you’ll see these dark floors balanced against bright white cabinets, colorful accent walls and contemporary kitchen decor. Dark floors offer a sleeker look that sets the perfect tone for contemporary lines and minimalist decor. Gray flooring, particularly gray wood, has grown quickly over the last decade. Although gray tiles, particularly in stone looks, are also very popular in the kitchen. Gray has quickly become the most popular trend,not just for flooring, but also for kitchens and homes in general. Stop by our newly expanded and renovated showroom and learn about the many flooring options available for your home.